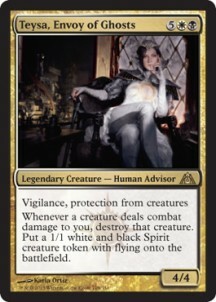 card text: Vigilance, protection from creatures Whenever a creature deals damage to you, destroy that creature. Put a 1/1 white and black Spirit token with flying onto the battlefield. Wayyyy too much to play. She's not overpowered enough that s ..